The first board book to feature photos of babies and toddlers in glasses doing things that kids love to do! Find us on Google+ or on Facebook! A board book for the littlest ones in glasses. "Glasses" features vibrant photographs of young toddlers and babies wearing real glasses and simply doing things that young kids like to do. The book is printed in full color as a sturdy board book that stands up to being played with and read over and over again! Click on Order the Book at the top of the page to order "Glasses"! "...this board book uses upbeat rhymes and clear full-bleed photographs of bespectacled kids to encourage children who need glasses to wear them and remind them why they are important. “Glasses on boys/ Glasses on girls/ With your glasses on you see the world!” reads a typical passage, as cheerful children play and show off their brightly colored frames..."
"Glasses is an adorable book that shows children the importance and benefits of wearing glasses. Photographs of happy babies, toddlers and preschool age children wearing brightly colored glasses adorn the pages. Along with happy children, this book includes catchy rhymes and descriptive words to engage young readers." "Our young reviewers really enjoyed sharing this book and we noticed that they spent a long time looking at the photographs and asking questions about the various designs and colours of the glasses. Highly recommended." "The book is short, playful and filled with the right amount of information to hold a young child’s attention. It will be a book a child will beg to read again and again." "Darling board book showing very young children, and some older children as well, wearing their glasses proudly." -- Pierce County Library System, Early Learning Newsletter. Nov., 2015 "Book of the Month"
"... a very cute book for getting kids comfortable with their glasses. (Or, I’d argue, a good book for ALL kids to read, especially when they start noticing differences between kids.) The rhyme is upbeat, the photographs colourful, and the glasses all cool..."
-- Melissa Ford, Stirrup Queens. Author of Navigating the Land of IF, Measure of Love, Apart at the Seams, and Life from Scratch. Ann Zawistoski is a reference librarian at Carleton College, a small, liberal arts college in Minnesota. She has two daughters, Zoe and Hazel. She is also the founder of the Little Four Eyes website and its associated facebook group, and a co-founder of the Great Glasses Play Day. Ann's daughter Zoe started wearing glasses at a year old. After a few rough weeks in the beginning convincing a headstrong toddler to wear her glasses, she's rocked her glasses ever since, but still loves to see other kids in glasses. 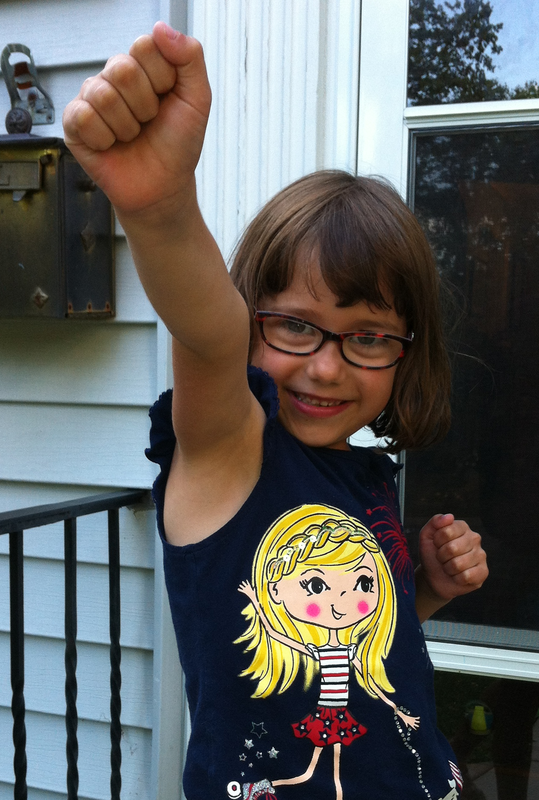 Zoe also loves monkeybars, climbing, baking, and writing recipes. Heide Woodworth is a Minneapolis-based freelance photographer and graphic designer. Glasses is published and distributed through Peeps Eyewear, a social enterprise that empowers kids to love their glasses and aims to raise awareness of the importance of early childhood vision health by giving back to our community. "Glasses" is now on GoodReads. Take a look, and if you've read the book, leave a review.